We used a variety of creation symbols stuck on lolly sticks - sun, stars, flame, trees, flowers,fish, birds, insects, animals and people. The children were asked to choose a creation symbol and then decide where they wanted to place it. 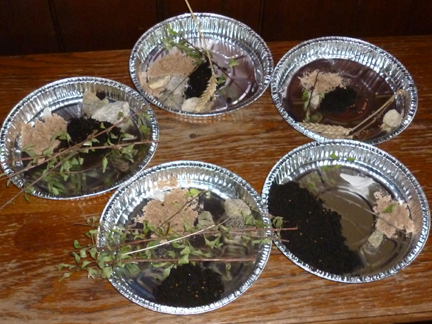 This took place during an event for children and families focusing on Noah, the ark and the flood. We wanted to create a prayer experience for these families who were mostly non church goers. 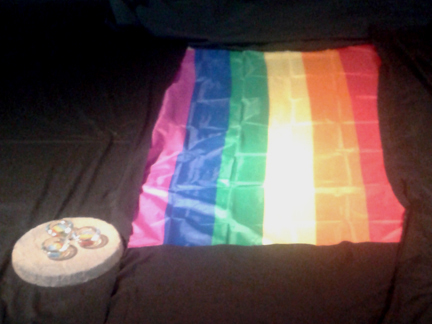 The rainbow banner was laid out on black cloth in the centre of the church crossing (always a dark place in the church). We dimmed the lights and lit rainbow candles (placed on stones). We had hoped to play music but unfortuneately we had technical difficulties. We had a short time of silence followed by a few spoken prayers. At the end the candles were extinguished by the children. Several people commented on the peaceful atmosphere. 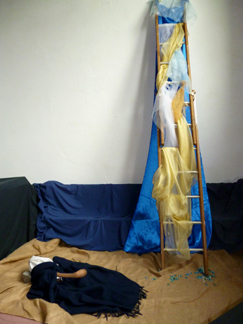 This prayer station was set up with a ladder and a sleeping figure (we used a posada figure). A blue cloth was hung behind the ladder which was draped with white and gold cloths. "I wonder if you have ever felt close to God? Where were you? Were you on your own or with other people? In a building or outside? Was it noisy or quiet? Were you active or still? 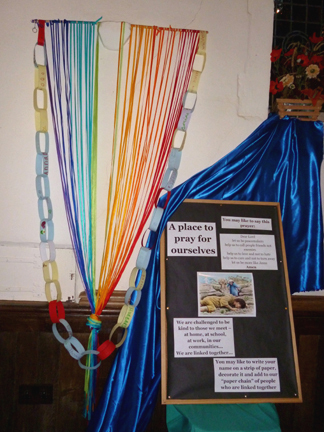 You may like to tie a ribbon on to the ladder and thank God for a time when you felt close to him..."
We used this prayer activity as part of an all age service looking at the story of Joseph and the difficulties of forgiveness. Joseph's coloured coat set him apart from his brothers and they could not forgive him for being their father's favourite. Joseph need to forgive his brothers for throwing him into a pit and selling him to the Egyptians. People were invited to think of someone or something that they found hard to forgive and to say a prayer for that situtaion. 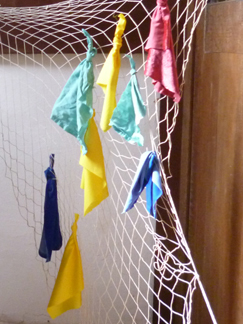 We suggested they take a coloured cloth (a reminder of Joseph's coat) and tie it onto the net to symbolise their prayer. "Is there anything that you are rejoicing about or want to say thank you for? 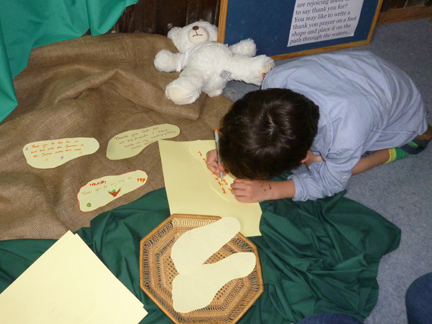 You may like to write a thank you prayer on a foot shape and place it on the path through the waters..."
This took plce during Lent - our theme was the parable of the prodigal son and the prayer area had a picture of Rembrandt's painting "The return of the prodigal son." 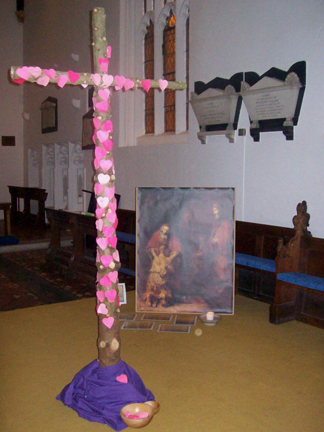 We used our Christmas tree cross and wrote prayers on pink hearts as a symbol of the love shown by the father to the son. "The sower flings the seed everywhere... Scatter the seeds all over your tray to remember God's love... God's love is an extravagant, abundant and unconditional... God keeps loving and giving his word to everyone - the passers by, the distracted, those who turn away and those who follow him... 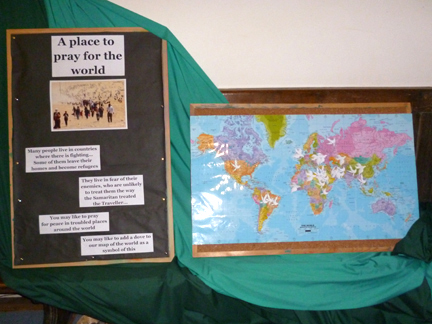 It is up to us how we respond..."
These prayers were used at an all age service with different prayer stations. 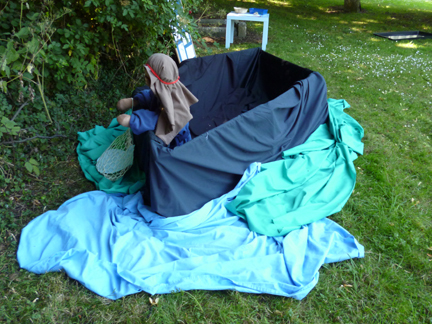 A "boat" was created using tables and cloths and a Posada figure placed inside to represent Andrew. At this station people were reminded of how Andrew brought his brother Peter to see Jesus. They were invited to think of a family member in need of prayer, write their name on a luggage label and tie it on the net. At other stations they remembered Andrew bringing forward the child with the loaves and fishes and invited to pray for children, and how he brought the Greeks to Jesus and were invited to pray for those in other countries by placing a cross on a world map. "Many people live in places where there is fighting. Some of them leave their homes and become refugees. They live in fear of their enemies who are unlikely to treat them the way the Good Samaritan treated the Traveller..."
"You may like to pray for troubled places around the world. You may like to add a dove to the map as a symbol of your prayers." This prayer space was offered as part of a children and families event that focused on the story of the Good Samaritan. "Dear Lord, let us be peacemakers. Help us to call people friends and not enemies, help us to love and not to hate, help us to care and not turn away, help us to be more like Jesus. Amen"
"We are challenged to be kind to those we meet at home, at school, at work and in out communties. We are all linked together..."
People were invited to write their name on a piece of paper and make it into a link of the chain, which was then hung from the rainbow.